Starr turn as Ringo's drum curator takes to the Palace stage for top talk . Beatles Radio: The Beatles, Solos, Covers, Birthdays, News The Fab 4 and More! BEATLEMANIA is set to take over Redditch later this month with a talk from Ringo Starr’s drum curator and friend, Gary Astridge. Gary has spent decades researching, organising and restoring The Beatles’ existing drum kits for their iconic value and historical significance. 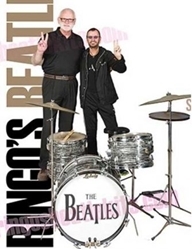 As a member of Ringo’s inner circle, Gary can offer residents an insight into the life of the band like few others can. He has amassed a personal collection of vintage drum kits which were all used by Ringo during his musical career. This includes Ringo’s first Ludwig drum kit which at one point was sold for an astonishing £2.1 million. Gary also has an intimate understanding of the drumming techniques used by Ringo and will be sharing those with members of the audience.